Sheldon Lee Glashow ( /ˈɡlæʃoʊ/ ; born December 5, 1932) is a Nobel Prize winning American theoretical physicist. He is the Metcalf Professor of Mathematics and Physics at Boston University and Eugene Higgins Professor of Physics, Emeritus, at Harvard University, and is a member of the Board of Sponsors for the Bulletin of the Atomic Scientists . The City of New York, often called New York City (NYC) or simply New York (NY), is the most populous city in both the state of New York and the United States. With an estimated 2017 population of 8,622,698 distributed over a land area of about 302.6 square miles (784 km2), New York is also the most densely populated major city in the United States. Located at the southern tip of the state of New York, the city is the center of the New York metropolitan area, the largest metropolitan area in the world by urban landmass and one of the world's most populous megacities, with an estimated 20,320,876 people in its 2017 Metropolitan Statistical Area and 23,876,155 residents in its Combined Statistical Area. A global power city, New York City has been described as the cultural, financial, and media capital of the world, and exerts a significant impact upon commerce, entertainment, research, technology, education, politics, tourism, art, fashion, and sports. The city's fast pace has inspired the term New York minute. Home to the headquarters of the United Nations, New York is an important center for international diplomacy. Ashkenazi Jews, also known as Ashkenazic Jews or simply Ashkenazim, are a Jewish diaspora population who coalesced in the Holy Roman Empire around the end of the first millennium. boson. The discovery of weak neutral currents was a significant step toward the unification of electromagnetism and the weak force into the electroweak force, and led to the discovery of the W and Z bosons. James Daniel "BJ" Bjorken is an American theoretical physicist. He was a Putnam Fellow in 1954, received a BS in physics from MIT in 1956, and obtained his PhD from Stanford University in 1959. He was a visiting scholar at the Institute for Advanced Study in the fall of 1962. Bjorken is Emeritus Professor at the Stanford Linear Accelerator Center, and was a member of the Theory Department of the Fermi National Accelerator Laboratory (1979–1989). The charm quark, charmed quark or c quark is the third most massive of all quarks, a type of elementary particle. Charm quarks are found in hadrons, which are subatomic particles made of quarks. Examples of hadrons containing charm quarks include the J/ψ meson, D mesons, charmed Sigma baryons, and other charmed particles. In quantum field theory, the GIM mechanism is the mechanism through which flavour-changing neutral currents (FCNCs) are suppressed in loop diagrams. It also explains why weak interactions that change strangeness by 2 are suppressed, while those that change strangeness by 1 are allowed, but only in charged current interactions. Howard Mason Georgi III is an American theoretical physicist and the Mallinckrodt Professor of Physics and Harvard College Professor at Harvard University. He is also Director of Undergraduate Studies in Physics. He was Co-Master and then Faculty Dean of Leverett House with his wife, Ann Blake Georgi, from 1998 to 2018. His early work was in Grand Unification and gauge coupling unification within SU(5) and SO(10) groups. In physics, a coupling constant or gauge coupling parameter is a number that determines the strength of the force exerted in an interaction. Usually, the Lagrangian or the Hamiltonian of a system describing an interaction can be separated into a kinetic part and an interaction part. The coupling constant determines the strength of the interaction part with respect to the kinetic part, or between two sectors of the interaction part. 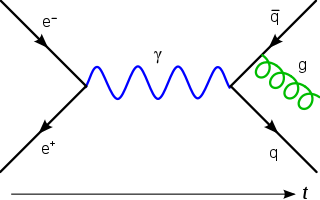 For example, the electric charge of a particle is a coupling constant that characterizes an interaction with two charge-carrying fields and one photon field. Since photons carry electromagnetism, this coupling constant determines how strongly electrons feel such a force and has its value fixed by experiment. Feza Gürsey was a Turkish mathematician and physicist. Among his most prominent contributions to theoretical physics, his works on the Chiral model and on SU(6) are most popular. Glashow is married to the former Joan Shirley Alexander. They have four children. Lynn Margulis was Joan's sister, making Carl Sagan his former brother-in-law. Daniel Kleitman, who was another doctoral student of Julian Schwinger, is also his brother-in-law, through Joan's other sister, Sharon. In physics, the fundamental interactions, also known as fundamental forces, are the interactions that do not appear to be reducible to more basic interactions. There are four fundamental interactions known to exist: the gravitational and electromagnetic interactions, which produce significant long-range forces whose effects can be seen directly in everyday life, and the strong and weak interactions, which produce forces at minuscule, subatomic distances and govern nuclear interactions. Some scientists speculate that a fifth force might exist, but this is neither widely accepted nor proven. The top quark, also known as the t quark or truth quark, is the most massive of all observed elementary particles. 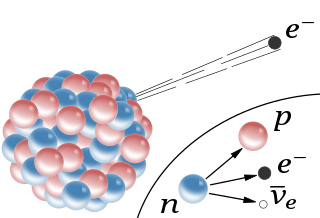 Like all quarks, the top quark is a fermion with spin 1/2, and experiences all four fundamental interactions: gravitation, electromagnetism, weak interactions, and strong interactions. It has an electric charge of +2/3 e. It has a mass of 172.44 ± 0.13 (stat) ± 0.47 (syst)GeV/c2, which is about the same mass as an atom of tungsten. The antiparticle of the top quark is the top antiquark, which differs from it only in that some of its properties have equal magnitude but opposite sign. In physics, a unified field theory (UFT) is a type of field theory that allows all that is usually thought of as fundamental forces and elementary particles to be written in terms of a pair of physical and virtual fields. According to the modern discoveries in physics, forces are not transmitted directly between interacting objects, but instead are described and interrupted by intermediary entities called fields. c, and a mean lifetime of 7.2×10−21 s. This lifetime was about a thousand times longer than expected. Jogesh C. Pati is an Indian American theoretical physicist at the SLAC National Accelerator Laboratory. José Leite Lopes was a Brazilian theoretical physicist who worked in the field of quantum field theory and particle physics. Luciano Maiani is a San Marino citizen physicist best known for his prediction of the charm quark with Sheldon Lee Glashow and John Iliopoulos. John Iliopoulos is a Greek physicist and the first person to present the Standard Model of particle physics in a single report. He is best known for his prediction of the charm quark with Sheldon Lee Glashow and Luciano Maiani. Iliopoulos is also known for demonstrating the cancelation of anomalies in the Standard model. He is further known for the Fayet-Iliopoulos D-term formula, which was introduced in 1974. He is currently an honorary member of Laboratory of theoretical physics of École Normale Supérieure, Paris. Goran Senjanović is a theoretical physicist at the Abdus Salam International Centre for Theoretical Physics (ICTP). He received his Ph.D. at the City College of New York in 1978, under the supervision of Rabindra Mohapatra. 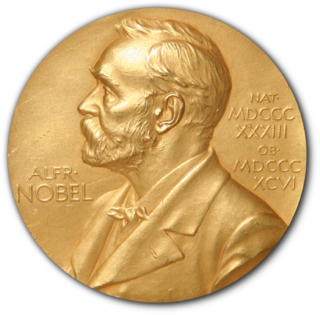 Before joining the ICTP in 1991, he worked as a staff member at the Brookhaven National Laboratory and as a professor of physics at the University of Zagreb. His major research interests are neutrino physics, unification of elementary particle forces, baryon and lepton number violation and supersymmetry. Cecilia Jarlskog is a Swedish theoretical physicist, working mainly on elementary particle physics. ↑ "Gürsey and Glashow share Oppenheimer memorial". Physics Today. American Institute of Physics. May 1977. doi:10.1063/1.3037556 . Retrieved 1 March 2015.